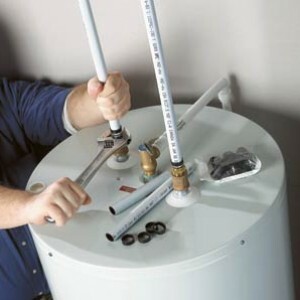 Storage water heaters are the most common and most familiar type of water heaters. The cylindrical tank we’ve all seen in the garage or basement is a storage water heater – also known as a tank-style water heater. If your water heater is more than 8 years old, it is time to start considering replacement. How old is your heater? Check out our Technical Reference section. Washington Water Heaters is the area’s leading expert in hot water systems, and can repair or replace your ailing tank style heater today. We stock a HUGE selection of tanks and parts to get you back into hot water very quickly. Nobody Gets You Into Hot Water Faster! Tankless or “on demand” water heaters are very popular in other countries around the world. Making the scene here in the USA about 5 years ago, they have become a very popular option with those needing more hot water. Learn more here and chances are that you too will want to make the switch to a tankless water heater. We specialize in residential installations – and are the area’s experts in Tank-less Water Heater installation in service. In 99% of cases, we’ll get you back in hot water the day you call. And, we give you the lowest prices, guaranteed*! Call us last for the best price, guaranteed! Quick Service and Free Loaners Available. Service to Seattle, Tacoma, Everett, Bellevue, Kirkland, Bothell, Redmond, Issaquah, Sammamish, Marysville Maple Valley, Renton, Kent, Auburn and Western Washington. Serving King, Thurston, Kitsap and Snohomish Counties. Tankless Hot Water Heater. New Install or Service & Repair. – Call Today!